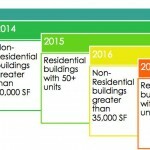 Regulation Updates: NYC’s Energy Efficiency Laws Expand To Cover More Buildings. Is Yours Affected? This entry was posted in All, Regulations/News and tagged benchmarking, Energy, LL84, LL88, NYC, regulations. Bookmark the permalink. This entry was posted in News and tagged benchmarking, DOB, Energy, NYC. Bookmark the permalink. This entry was posted in All, Regulations/News and tagged benchmarking, Boston, Energy. Bookmark the permalink. This entry was posted in All, Regulations/News and tagged benchmarking, Energy, Washington DC. Bookmark the permalink. Over Nine Million Sq. Feet Benchmarked. Now What? This entry was posted in All, Regulations/News and tagged benchmarking, Energy. Bookmark the permalink.